Calling all knitters, bakers, soap makers and conservers! 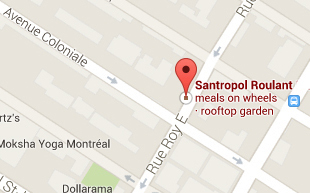 Santropol Roulant will be hosting a Holiday Craft Fair on November 29 from 11am to 5pm at our building. Home-made delights will be available to purchase in a festive atmosphere complete with gingerbread cookies and tea to warm your body and soul. We invite dedicated crafty volunteers to come sell their goodies free of charge. We will have tables and you will provide the stock! If you would like to sign up for a spot, please contact Isabelle with a description of what you will be selling and a photo, if possible. Priority will be given to active volunteers. And if shopping is more your game, swing by on the 29th of November to check out the products. Get your holiday shopping over and done with while also supporting small-scale artisans and the local community. The General Store will be open as always where all the products are locally sourced and organic. Stress free holiday shopping that gives back to the community. And gingerbread! What more could you ask for! See you on the 29th.